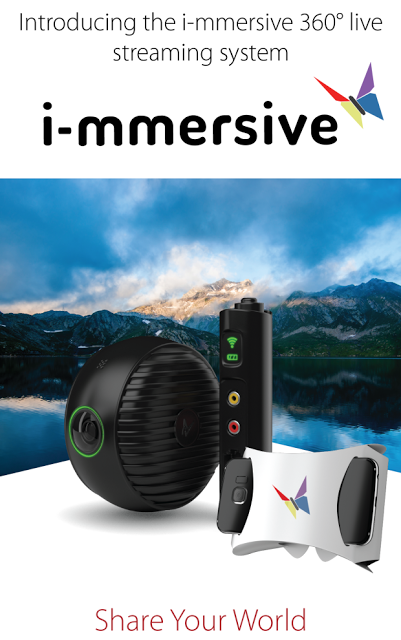 ​The I-mmersive is an end-to-end 360 system that promises 4k 360 live streaming, with no stitching or postprocessing needed. The system includes the VEYE camera, which has two 220-degree lenses with f/1.8 aperture paired with Sony sensors. The VEYE camera has an unusual form factor that looks like a vertical disc. The photo resolution is 12mp and the video resolution is 2560 x 1920 per sensor, and it can stream at 30 fps. The VEYE can be supplemented with a base stand with a more powerful Wi-Fi antenna. Strangely, the base stand has what looks like an antiquated RCA-type video and audio connector. In addition to hardware, I-mmersive wants to provide a livestreaming system called Ticket VR, which can be monetized so that you can receive PayPal payments from viewers. I-mmersive just launched its Indiegogo crowdfunding campaign, with a projected delivery to backers in April 2017. The early bird price for the VEYE is $249, or $309 with the base stand. As a reminder, crowdfunded projects can fail, with products that don’t live up to the descriptions, or products that are not even sent to backers. Mashable tries the V One ultrathin VR headset … and it works!